Faster wound healing and computer memory efficiency might not seem like they have a lot in common. Nor would enormous space satellites and semiconductors one millionth the width of a strand of human hair. But all four of these Lehigh engineering research subjects have been heralded by the National Science Foundation (NSF) this year in the form of Faculty Early Career Development (CAREER) Awards—a result that speaks volumes about the strength of up-and-coming research endeavors across the Rossin College. Each of these individuals is growing into an academic powerhouse, and we are starting to see the impact of their efforts through the technologies and students being minted in their labs. The Rossin “Fab Four”—Xiaochen Guo, P.C. Rossin Assistant Professor of electrical and computer engineering; Brandon Krick, assistant professor of mechanical engineering; Kelly Schultz, P.C. Rossin Assistant Professor of chemical and biomolecular engineering; and Nicholas Strandwitz, assistant professor of material science and engineering—hail from four very different scientific and personal backgrounds, and possess wildly-divergent interests. According to Coulter, this is Lehigh at its finest. Like an earthworm or a beaver, the human mesenchymal stem cell (hMSC) can engineer its environment and reshape the world around it. When placed in a Jello-like material known as a hydrogel, the cell secretes a substance that breaks down and "remodels" the material, a necessary step in allowing it to move around. These particular human stem cells—which have the ability to differentiate into bone, cartilage, muscle and fat cells—play a vital role in wound healing. Once hMSCs migrate to the affected site, they regulate inflammation and restart healing in chronic wounds. One strategy to foster wound healing, according to Schultz, is to implant a hydrogel infused with hMSCs directly into a wounded area. The hydrogel provides structural support to the surrounding tissue while the stem cells differentiate and call the appropriate cells to the wound for tissue regeneration. With CAREER support, Schultz will focus on how hMSCs handle “rheologically distinct” environments they encounter as they move—in other words, materials with features that contain interfaces or gradients in stiffness. Schultz believes hydrogels can be developed to optimize wound healing as well as maintain structural integrity of the surrounding tissue. Around the turn of the decade, NASA’s Kepler Space Observatory lived like a rock star. Launched in 2009 into an Earth-trailing heliocentric orbit, it turned out an amazing amount of work over a short period of time, changing its fans’ perceptions of their very place in the universe. But within four short earth years, Kepler’s moment had passed: it seemed the $600 million wonder, like many a pop culture hero before it, had found it was indeed better to burn out, than to fade away. By the middle of 2013, two of the observatory’s four reaction wheels had failed. Kepler had already exceed goals set by NASA, and the wheel failures came as little surprise to scientists familiar with the elevated friction levels experienced in space. Kepler could no longer lock onto faraway stars precisely enough to learn anything substantive, and was reprogrammed to take on a less strenuous set of tasks. A satellite in orbit is a giant machine, as large as tens of meters across. This enormous, expensive, somewhat unwieldy device needs to be condensed down in size—to anywhere between a watermelon and a Volkswagen—in order to withstand the forces set upon it during its journey into outer space. And once it reaches its orbit, it also needs to delicately unpack itself without damage. The low pressure of space presents yet another major challenge: traditional lubricants vaporize. In this extreme environment, how can moving parts remain suitably slick? Krick and his team will explore this and related questions by focusing on a powdery substance called Molybdenum Disulphide (MoS2) and its suitability as a lubricant in space and other extreme environments. Sandia National Laboratories is a partner on the project, and Krick says their analytical tools and state-of-the-art computational capabilities will be important when it comes to performing molecular dynamics simulations. According to Krick, developed countries lose an estimated 2 to 7 percent of their gross domestic product to costs associated with friction and wear, so advancing the fundamental science of friction and wear can have benefits much closer to home. “The toll is approaching a trillion dollars in the U.S. alone,” Krick says. “Friction is necessary, but we need to be able to predict, control and in many cases reduce it. Through this project, we hope to enable progress in the aerospace industry and space exploration, and perhaps find ways that this research can help fight friction right here on Earth. Researchers have been studying issues related to locality in computer memory systems for a long time, Guo says. When a system gathers data, she explains, it does so in chunks that get stored on a relatively small hardware storage called cache, which is located close to the central processing unit, or CPU. Based on the principle of locality, a user accesses one bit of data, and the system fetches the adjacent block of data. This happens, in theory, to improve efficiency—in case additional local data is requested in the future. Cache makes it happen instantaneously, instead of waiting for further data to be gathered. Unfortunately, this can be a waste of energy and bandwidth because the extra data, which often goes unused, eats away at available storage. Previous attempts to solve this issue focused on increasing memory overhead, but it still takes energy and space to store of metadata, which must be used in order to identify and track where data is being stored. With her CAREER project, Guo plans to take a different approach. She will instead focus on the ability to detect patterns in memory access. When a system runs multiple tasks at once or performs something fairly complex—think about the random scrolling and clicking that defines your social media habits—Guo's designs can enable hardware to learn and eventually predict patterns based on past and present behavior. When these predictions are perfected, the system will fetch and cache only the most useful data. But social media is only the tip of the iceberg. Among other applications, Guo believes that this solution is especially important when it comes to deep learning. The average computer is made up of approximately 1.5 billion transistors, and these parts are as small as five nanometers thick, says Strandwitz, and scientists are approaching the ability to produce transistors that are the size of just several atoms. One process by which these infinitesimal parts are created is called atomic layer deposition, or ALD. When done at low temperatures, ALD gives scientists the ability to build a material one atomic layer at a time, on the order of one-tenth of a nanometer. But if the temperature during this process isn’t high enough, atoms can be locked in less-than-ideal configurations. The ability to lock atoms into an ordered configuration, or the level of “crystallinity” in the structure, has a dramatic impact on the electronic properties of the material. Strandwitz will use his CAREER Award to develop a multi-step method of growing materials, including a new process for observing the chemical processes that lead to a reconciliation of precise thickness and control of crystallinity. To do so, he will apply a technology called reflection high energy electron diffraction, or RHEED, which works like the colors that appear when a film of oil forms on water. Strandwitz reports that the first step in the process is already complete, courtesy of an innovative campus program that encourages undergraduates to engage in research. The base ALD instrument was designed and constructed as part of a 2016 Lehigh Mountaintop Summer Project, built with the intention of eventually adding a RHEED gun. With the NSF's recent support, Strandwitz will now modify the ALD chamber to accommodate the RHEED gun and other components and perform software design to integrate the system. "Lehigh is renowned for nanocharacterization," Strandwitz says. “This new equipment will be a powerful extension of our world-class materials and processing capabilities." 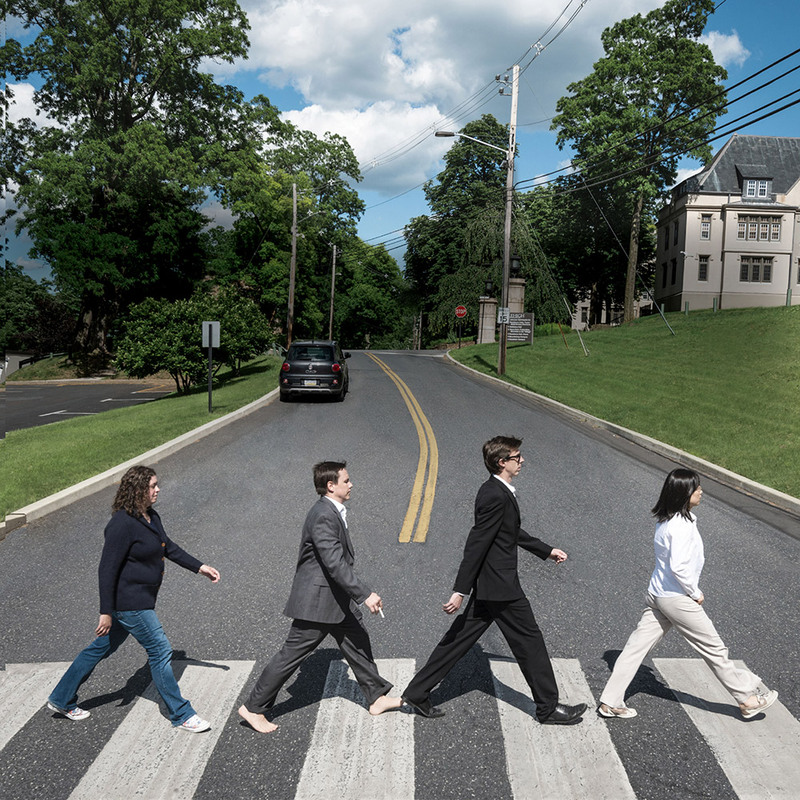 The Beatles had Billy Preston, and the Rossin Fab Four have Yue Yu, an assistant professor of mathematics in Lehigh’s College of Arts and Sciences. Through her 2018 CAREER award— Lehigh’s fifth this year — Yu seeks to develop a mathematical framework and software to improve the modeling of soft tissue damage. Her ultimate goal is to help clinicians better understand the mechanisms of heart valve damage.